This study aimed to comparatively observe the effects of the volar plate for preserving the pronator quadratus (PQ) during distal radius fracture treatment. The patients were divided into the PQ preservation group (preservation group) and the PQ suture group (suture group), and the drainage amount and PQ function recovery time were recorded after internal fixation. Some of the patients underwent computed tomography scanning to measure wrist muscle thickness, and we exposed and measured the PQ width and thickness intraoperatively and performed a pathological examination. Anatomical differences in the PQ were noted between the two groups. Most muscles of the suture group exhibited fibrosis and scarring and adhered to the surrounding tissues. The average muscle thickness was significantly reduced to about 4 mm, average drainage was approximately 50 mL, and recovery of the wrist pronation function required approximately 4-6 weeks. The preservation group exhibited normal muscles, mild adhesions, and close to normal muscle width and thickness. The average muscle width was approximately 35 mm, average thickness was approximately 7.6 mm, average drainage was approximately 30 mL, and the wrist pronation function recovered in 2 weeks. PQ preservation was feasible, with less bleeding, faster PQ function recovery, fewer adhesions, and other advantages, and the postoperative muscle structures were close to normal. After being sutured, the PQ exhibited muscle atrophy and scarring, which might result in muscle dysfunction. Distal radial fractures, Pronator quadrates, Surgery. The pronator quadratus (PQ) is a quadrilateral muscle located at the distal 1/3 of the forearm that is attached to the radius, ulna, and forearm interosseous membrane. In all specimens from the superficial head to the deep head, the latter was thicker and the average thickness of the entire muscle was 5.5 cm × 5.0 cm × 1.0 cm. The anterior interosseous neurovascular bundle, anterior interosseous artery, and anterior nerve were the main artery and nerve of the PQ. The main role of the PQ is to enable pronation of the forearm. Recently, certain studies of PQ function confirmed that the superficial head participated the initial pronation of the forearm, while the deep head was the stable structure of the driving force toward the distal radioulnar joint . In the past 20 years, the treatment approaches to distal radius fractures have changed greatly, but complex and unstable fractures were more commonly treated with open reduction plus internal plate fixation [2-4]; however, because this surgery destroys the PQ, controversy about its repair persists [5-7]. Recent studies examined whether suturing the PQ affected wrist function . Although the micro-invasive surgical treatment of preserving the PQ through the volar approach in treating distal radial fractures has been widely used domestically and abroad [9,10], few studies have described the anatomical characteristics of the PQ. Using mechanical tests, Armangil et al. that suturing the PQ decreased its strength and endurance ; similarly, McConkey et al. used lidocaine to anesthetize the PQ and confirmed from another angle that suturing the PQ would cause muscular dysfunction . Nho et al. measured the PQ width upon the withdrawal of the plate from the patients with a sutured PQ and found that it was approximately 68% of normal, but muscle width variations showed no significant effects on wrist function . We divided the patients with distal radial fractures into the PQ preservation and PQ suture groups, the surgery used the Herry approach to testify the clinical feasibility of PQ preservation. The postoperative drainage and functional recovery of the two groups were followed up. The PQ was also observed and measured during the second internal fixation removal surgery, and the thickness was measured by imaging. This study comparatively studied the clinical results of these two surgical methods and confirmed the existence of PQ muscle atrophy and scarring, aiming to provide the anatomical basis for the effects of PQ suturing on wrist function as well as discuss the clinical superiority of PQ preservation. A total of 102 patients who suffered from distal radial fractures and underwent volar plate open reduction plus internal plate fixation in our hospital between August 2013 and August 2014 were selected, including 91 patients who underwent PQ suturing and 11 patients who underwent PQ preservation. Twenty patients (eight men, 12 women; mean age, 56 years; range, 29-73 years) who underwent internal fixation removal between June 2014 and January 2015 in our hospital were selected, including three with type A, one with type B, and 16 with type C according to the AO typing with a mean postoperative follow-up period of 16 months (range, 8-23 months). The patients underwent anatomical locking plate fixation through the volar Herry approach during the first surgery, among which 16 received PQ repair, while four received PQ preservation. Those with a B-type fracture did not receive PQ preservation. The wrist functions of these 20 patients were scored by the Gartland-Werley scoring system as 15 cases of excellent effects (85%), two cases of good effects, two cases of acceptable effects, and one case of poor effects. Four patients underwent CT scanning of the wrist before the secondary surgery to measure PQ thickness. All the patients in this group were followed up for 8 months. This study was conducted in accordance with the declaration of Helsinki. This study was conducted with approval from the Ethics Committee of shandong University. Written informed consent was obtained from all participants. The internal fixation material was provided by Shandong Weigao Orthopaedic Materials Co., Ltd. (Jinan, China). The first internal fixation of all patients was performed using the volar Herry approach, in which we cut the partial transverse carpal ligament, pulled the radial artery and flexor tendon, and exposed the PQ. In the preservation group we identified the near and far edge of the muscle, then slightly separated outside the periosteum at the distal muscle edge and pulled the muscles toward the proximal end to expose the fracture, which was then reduced under the C-arm and temporarily fixed with a Kirschner wire. Next, a periosteum screwdriver was used to isolate the muscles toward the distal end from the lateral periosteum of the proximal muscle edge to form the steel channel. The LCP plate was then inserted from the near side to the distal side to fully preserve the PQ, the C-arm X-ray was used to check the plate position, and screws were used to fix the plate. In the suture group, the PQ was cut 2-3 mm away from its end point of the radial site, followed by subperiosteal stripping and pulling toward the ulnar side to fully expose the volar bone surface of the distal radius, the plate was placed, and after the internal fixation, 3-0 Ethibond was used to interruptedly suture the PQ. A drainage tube was routinely placed during the surgery. The drainage tube was pulled out 24-48 hours later, the wound dressings were replaced, and the drainage amount was recorded. The suture group was asked to practice wrist flexion and extension exercises 3-5 days after the surgery when the swelling subsided significantly and practice active and passive pronation exercises 3 weeks later. The preservation group was asked to practice the active wrist flexion and extension exercises as well as the pronation exercises 3-5 days after the surgery when the swelling subsided significantly and practice the passive functional exercises 3 weeks later. In the second surgery, the internal fixation was withdrawn. All of the patients selected the original Herry approach, in which we isolated the wrist flexor and the radial artery, pulled the radial wrist flexor and the long flexor muscle of thumb toward the ulnar side, pulled the radial artery toward the radial side to expose the PQ, and isolated the adhesions between the PQ and the surrounding tissues. In the suture group, we cut the full thickness of the PQ at the original incision and performed sharp isolation on the steel surface, rolled the PQ toward the ulnar side to measure the muscle thickness and observe the general tissue structures; explored the adhesions between the PQ and the surrounding tissues; and incised partial specimens for the pathological examination. In the preservation group, we measured the PQ width and thickness. It was feasible to preserve the PQ when we treated the distal radial fractures through the Herry approach; it was not difficult to place the plates and screws intraoperatively. The surgical difficulties were not increased, and the gentle intraoperative procedures could better preserve the PQ integrity. The muscle widths and thicknesses of the four patients were similar to those of the normal group, with a mean muscle width of 35 mm (range, 32-40 mm) and mean muscle thickness of 7.6 mm (range, 6-10 mm) (Table 1 and Figure 1). The wrist CT scan was performed before the second surgery to measure the muscle thickness of three patients (Figure 2). The mean drainage was approximately 30 mL (Table 1), while the wrist PQ functional recovery required 1-2 weeks (Table 1). Table 1. Statistics of main data of the 20 study subjects in this study: the suture group No 1-16 and the preservation group No 17-20. Figure 1. The preservation group. A) The first internal fixation preserved PQ and placed the plate. B) The second surgery withdrew the internal fixation and found no significant muscle atrophy, scarring or proliferation of fibrous tissues. Figure 2. The preservation group. A) Preoperative CT measurement of PQ thickness. B) 8 months after the surgery, the fracture healed, and the CT scanning before the second surgery revealed that the thickness of PQ was close to the normal. The second surgery revealed that the PQ was adhered to the surrounding tissues, plate, and interosseous membranes. 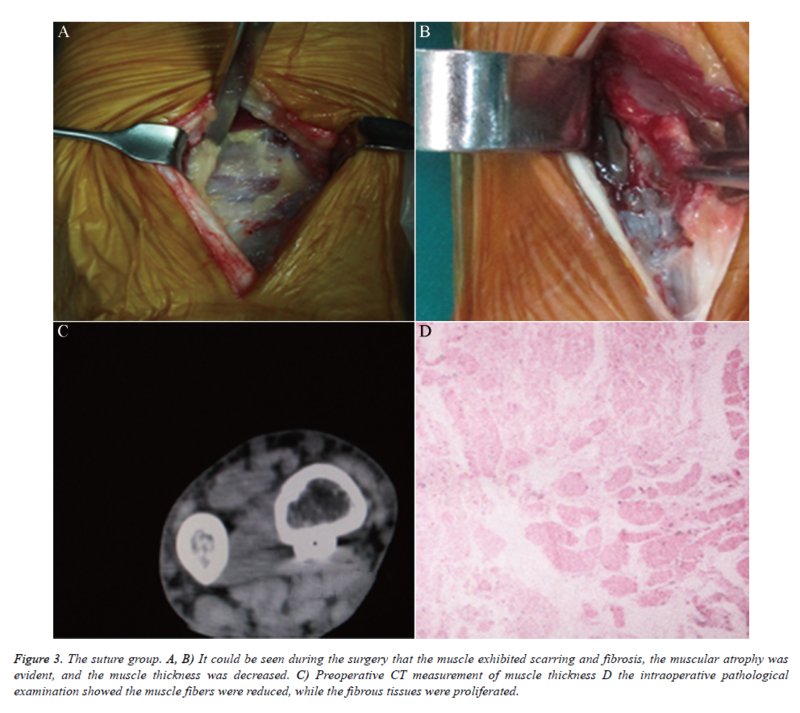 The adhesions of the suture group were more severe than those of the preservation group, and the PQ exhibited significant muscle atrophy, scarring, and fibrosis, the muscle fibers became loose and thinner, and the number was decreased (Figure 3). The proximal side of the PQ of one patient was close to normal, while the distal side exhibited semi-scarring. The mean muscle thickness (including the scar ingredients) was 4 mm (range, 2-5 mm) (Table 1), and the boundaries between the PQ and the surrounding tissues were unclear; thus, the width was not measured, although the pathological examination revealed that the muscle fibers were significantly decreased and replaced by scar tissue. Before the second surgery, one patient underwent CT scanning to measure the muscle thickness. The mean drainage was 50 mL (Table 1), and the wrist PQ functional recovery required 4-6 weeks (Table 1). Figure 3. The suture group. A, B) It could be seen during the surgery that the muscle exhibited scarring and fibrosis, the muscular atrophy was evident, and the muscle thickness was decreased. C) Preoperative CT measurement of muscle thickness D the intraoperative pathological examination showed the muscle fibers were reduced, while the fibrous tissues were proliferated. In recent years, the surgical method using the distal radial volar plate to treat distal radial fractures became increasingly more popular, and a number of studies reported good functional scores and fewer complications [13-17]. However, controversy remains regarding the necessity for intraoperative PQ repair and the volar approach. Recent studies have suggested that PQ suturing had no effects on wrist function [8,13], but reports of the clinical results of PQ suturing and preservation are rare. Most recent studies reported that the volar plate treatment of distal radial fractures might cause PQ dysfunction, and the reasons were analyzed as follows: 1. original muscle injuries; 2. unreliable muscle injury suturing; 3. changed muscle tension; and 4. muscle atrophy and partial healing . We believed that the PQ dysfunction might also be related with factors such as muscle damage caused by intraoperative cutting, peeling, and suturing, while the intraoperative pulling might also cause anterior interosseous nerve damage as well as adhesions between the muscles and the surrounding tissues. Another study confirmed the feasibility of PQ preservation by the volar approach in treating distal radial fractures, which considered it feasible and easy to preserve the PQ . In 28 cases of pronator quadratus reservation surgery and follow-up, Cannon confirmed that preservation of the pronator quadratus was possible, and the same fracture reduction effects as those without reserving the pronator quadratus were also achieved . Using mechanical tests, Armangil et al. that suturing the PQ decreased its muscle strength and endurance  similar to the results of McConkey et al., who used lidocaine to anesthetize the PQ, which confirmed from another angle that suturing the PQ would result in its dysfunction . Through the clinical observation in this study, we found that it was feasible to preserve the PQ through the Herry approach for treating distal radial fractures, it was not difficult to place the plates and screws, and surgical difficulty was not increased since a gentle intraoperative procedure might better preserve the PQ integrity. After suturing of the PQ, cutting and stripping injuries might cause muscle atrophy, scarring, and postoperative PQ dysfunction. The surgical preservation of the PQ while treating distal radial fractures had such advantages as less bleeding, faster functional recovery, reduced tendon adhesions, and better preservation of the anatomical structures of the PQ. Since there was no need to incise and suture the PQ during the surgery, operative time was saved, but we did not measure the muscle strength of the PQ and could not experimentally confirm whether the PQ functions of the preservation group were normal. We speculated that preserving the anatomic integrity of the PQ might better maintain muscle functions and provide the anatomical basis for treatments that used a PQ muscular flap to treat scaphoid bone necrosis and other wrist disorders . Preserving the radial attachment points of the PQ could reduce damage to the blood supply around the fractures . Increased fracture healing rate and time were required, but this study did not follow up the fracture healing time. The preservation of PQ anatomic structures could better maintain the dynamic stability of the distal radioulnar joint, reducing the incidence of wrist pain and discomfort after distal radial fractures. This requires further confirmation in future studies, and we recognized the limitations of this study that different types of fractures might affect the results. Because of the fewer cases in the preservation group, we did not perform a control study of wrist functions, so we performed no statistical analysis. Some fracture types might require cutting of the PQ for fracture reduction as well as the placement of a plate and screws, but this requires further studies with larger sample sizes. During the treatment process, we referred to the experience of Ciccone et al. , in which the treatment team consisted of the surgeon and the care manager, the latter of whom provided the patients with disease-related knowledge before surgery, performed a comprehensive assessment of each patient after surgery, recorded the relevant information, communicated with the surgeons to guide the patients’ rehabilitation and training, helped the patients develop new daily behaviors, and encouraged the patients to perform reasonable and positive functional rehabilitation and training. This team treatment mode achieved good clinical results. Stuart PR. Pronator quadratus revisited. J Hand Surg Br 1996; 21: 714-722. Chung KC, Shauver MJ, Birkmeyer JD. Trends in the United States in the treatment of distal radial fractures in the elderly. J Bone Joint Surg Am 2009; 91: 1868-1873. Jupiter JB, Marent-Huber M, LCP Study Group. Operative management of distal radial fractures with 2.4 millimeter locking plates. A multicenter prospective case series. 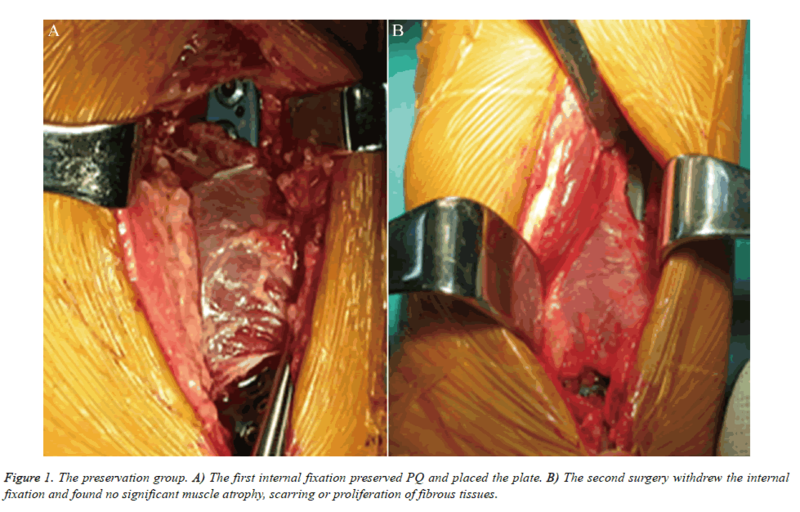 J Bone Joint Surg Am 2009; 91: 55-65. Chung KC, Petruska EA. Treatment of unstable distal radial fractures with the volar locking plating system. Surgical technique. J Bone Joint Surg Am 2007; 89: 256-266. Dos Remedios C, Nebout J, Benlarbi H, Caremier E, Sam-Wing JF, Beya R. Pronator quadratus preservation for distal radius fractures with locking palmar plate osteosynthesis. Surgical technique. Chir Main 2009; 28: 224-229. Figl M, Weninger P, Liska M, Hofbauer M, Leixnering M. Volar fixed- angle plate osteosynthesis of unstable distal radius fractures: 12 months results. Arch Orthop Trauma Surg 2009; 129: 661-669. McConkey MO, Schwab TD, Travlos A, Oxland TR, Goetz T. Quantification of pronator quadratus contribution to isometric pronation torque of the forearm. J Hand Surg Am 2009; 34: 1612-1617. Tosti R, Ilyas AM. Prospective evaluation of pronator quadratus repair following volar plate fixation of distal radius fractures. J Hand Surg 2013; 38: 1678-1684. Rey PB, Rochet S, Loisel F, Obert L. Technical note: How to spare the pronator quadratus during MIPO of distal radius fractures by using a mini-volar plate. Chir Main 2014; 33: 95-99. Fan J, Chen K, Zhu H, Jiang B, Yuan F, Zhu X, Mei J, Yu G. Effect of fixing distal radius fracture with volar locking palmar plates while preserving pronator quadratus. Chin Med J (Engl) 2014; 127: 2929-2933. Armangil M, Bezirgan U, Başarır K, Bilen G, Demirtaş M, Bilgin SS. The pronator quadratus muscle after plating of distal radiusfractures: is the muscle still working? Eur J Orthop Surg Traumatol 2014; 24: 335-339. Nho JH, Gong HS, Song CH, Wi SM, Lee YH, Baek GH. Examination of the pronator quadratus muscle during hardware removal procedures after volar plating for distal radius fractures. Clin Orthopedic Surg 2014; 6: 267-272. Hershman SH, Immerman I, Bechtel C, Lekic N, Paksima N, Egol KA. The effects of pronator quadratus repair on outcomes after volar plating of distal radius fractures. J Orthop Trauma 2013; 27: 130-133. Hakimi M, Jungbluth P, Windolf J, Wild M. Functional results and complications following locking palmar plating on the distal radius: a retrospective study. J Hand Surg Eur Vol 2010; 35: 283-288. Gruber G, Zacherl M, Giessauf C, Glehr M, Fuerst F, Liebmann W, Gruber K, Bernhardt GA. Quality of life after volar plate ﬁxation of articular fractures of the distal part of the radius. J Bone Joint Surg Am 2010; 92: 1170-1178. Arora R, Lutz M, Deml C, Krappinger D, Haug L, Gabl M. A prospective randomized trial comparing nonoperative treatment with volar locking plate ﬁxation for displaced and unstable distal radial fractures in patients sixty-ﬁve years of age and older. J Bone Joint Surg Am 2011; 93: 2146-2153. Kim JK, Park SD. Outcomes after volar plate ﬁxation of low-grade open and closed distal radius fractures are similar. Clin Orthop Relat Res 2013; 471: 2030-2035. Lo HY, Cheng HY. Clinical study of the pronator quadratus muscle: anatomical features and feasibility of pronator-sparing surgery. BMC Musculoskelet Disord 2014; 15: 136. Cannon TA, Carlston CV, Stevanovic MV, Ghiassi AD. Pronator-Sparing Technique for Volar Plating of Distal Radius Fractures. J Hand Surg Am 2014; 39: 2506-2511. Kara T, Gunal I. Preiser’s disease treated by pronotor quadratus pedicled bone graft. J Plast Surg Hand Surg 2014; 48: 455-456. Rath S, Hung LK, Leung PC. Vascular anatomy of the pronator quadratus muscle-bone flap: a justification for its use with a distally based blood supply. J Hand Surg Am 1990; 15: 630-636. Ciccone MM, Aquilino A, Cortese F, Scicchitano P, Sassara M, Mola E, Rollo R, Caldarola P, Giorgino F, Pomo V, Bux F. Feasibility and effectiveness of a disease and care management model in the primary health care system for patients with heart failure and diabetes (Project Leonardo). Vasc Health Risk Manag 2010; 6: 297-305.